beta review – Welcome to Spinksville! Star Trek is surely one of the best loved IPs of all time. It has spawned numerous TV series, films, books, comics, conferences, theme pubs, university courses, RPGs, computer games, Barbie dolls, and assorted other merchandise. This is the IP that INVENTED slashfic. Let’s pause and think about that for a moment. Ok, done. 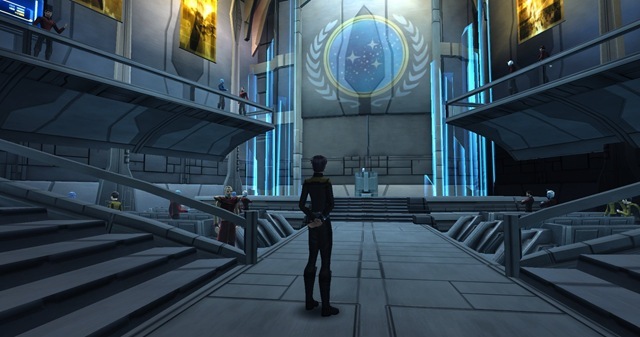 And now, thanks to Cryptic Studio’s latest efforts with Star Trek Online, the Federation is all set to expand into MMO space. But is this game for you? Visually stunning. The game is an absolute pleasure to watch. The character animations while on ground missions are also smooth as silk – your character will dive into a roll, drop to one knee to take aim, shoulder a phaser rifle as they run – it looks good. It is also easy to take great screenshots, even for graphical nonentities like your truly. Space combat is very different from the standard MMO model. Positioning is important. So is watching the other guy’s shields and keeping an eye on your own. I enjoyed it very much. 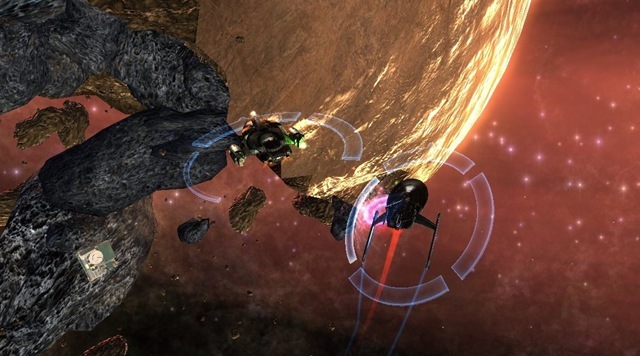 If you’ve been on the lookout for a space dogfighting game, this will be worth a look. Open groups. It’s very easy to end up teaming up with other people productively. If you zone into a planet on a mission and others have the same mission, you will automatically join them. We weren’t very organised in beta, but you did feel like a team. Some of your abilities in ground combat depend on your weapon. So if you are equipped with a phaser, you’ll automatically get the option to fire or to stun (i.e.. set phaser to stun). It’s a neat and intuitive mechanic. Interesting use of bridge officers to add extra customisation. In an intriguing mechanic, you can train your bridge officers to give you extra ability options in space and extra backup on ground missions. One virtual server. You’ll be able to play alongside people from all over the world, without being separated by continent. Great Star Trek audio flavour. All of the sound effects and the music screamed Trek, the team has made great use of these assets. Using established Star Trek actors for voiceovers is also great, but it was the sound effec ts that dragged me in. Excellent character and ship customisation. This is one of Cryptic’s signature strengths and they do not disappoint. What is more impressive is that players are herded neatly towards creating thematic characters. So there’s a lot of freedom, but it’s hard to make something that looks completely impossible for the setting. The different skills and abilities on offer look complex at first sight. Your character can train different skills, your bridge officers can train skills, and you can also customise your ship’s loadout with different abilities. It isn’t easy to figure out what some of them do or how they might be useful. This feels like a complex game with a lot to learn – whether that’s because of depth or just because there is so much stuff I’ve yet to really fathom. The ground missions are not as engaging as space combat. It isn’t bad per se, and did improve a lot with the latest patch, but the majority of ground missions I tried reminded me strongly of CoH instances. Wander around, collect stuff, rescue people, or explore the area, and shoot groups of enemies when you run into them. “Grindy, Repetitive Missions.” I put that in inverted commas because it’s an MMO, dammit. If you enjoy flying your starship around and fighting other ships, you won’t find it dull. Uninspired chat and guild systems. The chat system is workmanlike but nothing more, similar with what we saw of guilds (fleets). Allowing fleets to build a starbase to use as a centre of operations is something I’d love to see in future. Is there enough game and enough world for a subscription? It’s fun, but is it fun enough to spend £10 per month on? Two character slots (three if you include Klingon). If you are an altaholic, this might be a red flag. Writing is serviceable but none of the NPCs really come to life. There’s no Frodo or Picard, or even a Thrall or Antonia Bayle. There are people who give you missions, none of them with striking personalities. Rubbish maps. Sorry Cryptic, but the area map is not useful to the point of why bother, it’s easier to just look around and eyeball the area. Why is it so hard to actually sit in the captain’s chair on the bridge? So why is the space combat so cool? 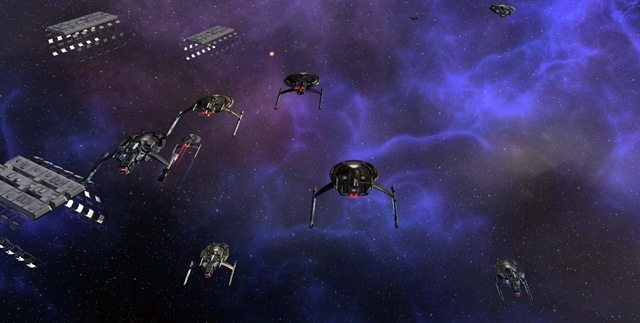 Your ship has four shields (fore, aft, port, and starboard – although Cryptic wimped out and called the latter two left and right), and so does the enemy. Your goal is to punch through the enemy’s shield with torpedoes and follow up with blasts of phaser fire to actually damage his or her ship. They will be trying to do the same to you. So it is important to keep an eye on your relative positioning and which of your weapons are facing the enemy and ready to fire. Ideally ships will circle each other, trying to get off the space equivalent of a broadside. You can fire all weapons simultaneously using spacebar, or if you want to show a little more finesse, you can fire them separately as they come to bear. Bridge officers may also have expertise in space combat which manifests as short term cooldown abilities that you can use. For example, the tactical officer might be able to boost torpedo damage for 20s, or the engineering officer might be able to boost shields temporarily. Because you are in space, there is also a 3 dimensional component. You can fly over the other ship, or underneath it. It’s not a true 3D fight, because you don’t have shields above or below to worry about, nor do you have top mounted lasers. For example, here my ship has blown a hole in the enemy shields. You can see that one of the barriers has gone. So hopefully I am in the process of trying to turn neatly and blast him with both fore and aft lasers simultaneously just where the shield is weak. What you end up with is an interesting style of combat with plenty of manoeuvring and tactical interest. I’m told it gets deeper later on into the game as you get a better ship with more options available. But I enjoyed it right from the start. Is there enough content to justify a subscription? This is a question that you can rarely answer in a beta. But still, is there going to be enough? Between the long missions (episodes), open group actions, limited crafting and PvP, will there be enough to keep players occupied? There is little of a virtual world feel to the game, much of the content is instanced, and the space stations themselves are fairly perfunctory. Crafting is Guilds Wars style, which means that you collect materials when you are out adventuring and then give them to an NPC to be made into equipment. There is the obligatory bank and auction house (was anyone else disturbed that you can apparently auction your bridge officers?). But the game will often feel like a group based space/ground fighter with a bit of character advancement thrown in for fun. To me, it felt like a model that might have worked better as free to play, and then charge people for the missions, fluff, and extra content. 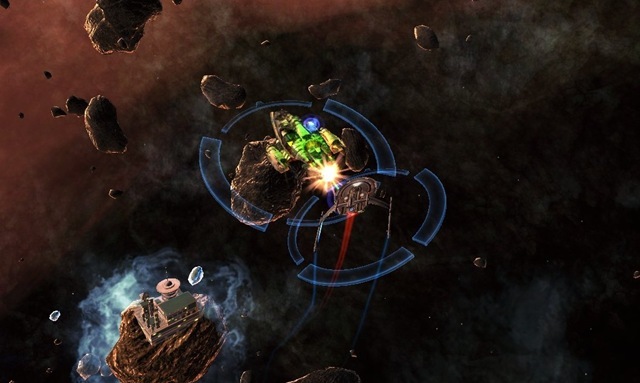 Still, Cryptic have an ambitious update schedule, with borg attacks, group ‘raidisodes’, more PvE action for Klingons, and more Space locations to explore. And finally, is there enough Trek? Star Trek is a moving target. The Trek of the original series is very different in theme to Deep Space 9 for example, and Voyager, The Next Generation, and Enterprise are different again. STO has a strong Trek feel. The space combat in particular with it’s more stately pace and attention to shields, orientation and power assignments feels right. The actual world in which you fight – perhaps not so much. There’s little room here for the strong themes of exploring new worlds, showing mercy to your enemies, and being a force for harmony and growth. That’s ditched in favour of shooting Klingons. 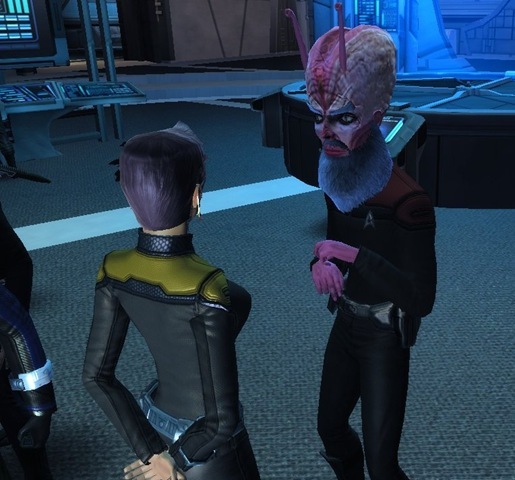 STO is probably a better game for it, but this may not be the Star Trek that diehard fans were hoping to immerse themselves in. Then again, the franchise itself is moving away from the idealism of the original series that caught so many hearts and minds in the first place. Here’s a great post by Mitch Wagner on the tor.com blog discussing how the latest film takes a different tack, and possibly not a better one.